What a great day of Disneylanding! Now THAT is how time should be killed (or at least maimed and left for dead). 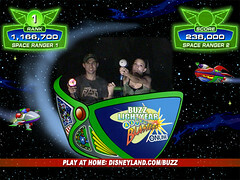 It’s hard to beat roaming around the happiest place on Earth with friends and seeing all those old acquaintances I thought were long gone while being sucked into the most impressive fantasy world ever created…unless of course you also happened to grab the number one spot for the day in the Buzz Lightyear Astro Blasters attraction! Yeah, you heard right. I’m a galactic hero…wanna make something of it?! Honestly though, I absolutely love that place. I’m reasonably sure my career with the company is over but I will always have a soft spot in my heart for those theme parks. Say what you will about how “evil” and “corporate” Disney is but if they can turn a profit while bringing smiles to the faces of millions upon millions of park-goers and their kids every year then there’s no way they can be all bad. You really just can’t help but smile on a day like yesterday. Granted I am a HUGE geek when it comes to the theme parks. I often have to FORCE myself to stop spewing history and describing how all the technology in the attractions work and yesterday was no different. It was an interesting mix of friends though so luckily at any given time I was only repeating stories to about half of my audience…whoops. The best part was that only a handful of the newer rides had any kind of line at all (Granted one of those rides I had a hand in creating and I would have loved to check up on it. 🙂 ) and all of the classics were practically walk-ons. The only time we really had to wait was for the new Midway Mania game featuring the Toy Story characters but even that was totally worth every minute. All in all I give the day an 11 on the 10 scale. Let’s hope the rest of “Moonshinery 2008” will be half as awesome! Wish me luck! Something tells me the Ostrich won’t have a replacement adapter. I’ve never been to Disneyland, so which is better, that or Disney World? @Anatomicsd: Probably not. Luckily I found a loaner pretty quickly! @missannw: You’ve definitely come to the right place. Having worked for both I can say without a doubt that Disneyland is better than the Magic Kingdom at Walt Disney World. But if you’re comparing the two resorts as a whole…the 42 square mile WDW just has too much to offer for the poor little one city block Disneyland to compete. But Disneyland is still MY theme park!